Sterilization and Infection Control remains paramount to our dental practice with our patients’ safety and well-being as our main focus of attention. We are aware that dental instruments are possible agents for pathogenic transmission from patient to patient, patient to doctor, and/or vice versa. At our Bangkok Smile MALO CLINIC, we carry out all possible sterilization and disinfection procedures needed for infection control. This is provided to each and every patient to prevent the transmission of AIDS Virus, Tuberculosis, Hepatitis, Tetanus, and other infectious diseases. We use appropriate protective garb such as gloves and masks. After each patient visit, the gloves are discarded, hands are washed and a new pair of gloves is used for the next patient. Disposable items like needles, syringes, and patient-drapes are for one-time use only and are disposed of after single use. Sterilization is the complete elimination or destruction of all forms of microbial life and is accomplished in healthcare facilities by either physical or chemical processes. Disinfection describes a process that eliminates many or all pathogenic microorganisms on inanimate objects with the exception of bacterial spores. Method of sterilization that may be used for these instruments and materials that are heat stable include steam under pressure (autoclave), chemical (formaldehyde) vapors, and dry heat. Out of the three methods, steam under pressure (i.e. autoclaving) is the most dependable method of sterilization. All of our dental instruments including our hand-pieces are sterilized to 135 degrees Celsius using a vaporizing effect created from high pressure pushing heat all over and through every part of the instrument, even in very tiny spaces. The dental instruments are scrubbed thoroughly to discard any dirt or debris. The dental instruments are rinsed utilizing an ultrasonic cleaner. Autoclaving is the best way to sterilize instruments. 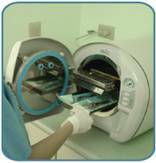 In our end, we carry out the process using our CE-certified Autoclave Machine prior to any type of treatment done to our patients. In order to confirm the efficiency of our autoclave machine, we use indicator strips to test and verify that the instruments are properly autoclaved at the same time. All our dental equipment and instruments are maintained and sterilized according to international standards with CE-certified sterilization machines. These very high standards have helped us attract various companies, schools, airline staff, and embassy personnel to sign corporate contracts with us. Packed and sterilized instruments are kept in a U.V. Chamber to maintain adequate sterilization. To ensure a bacteria-free environment in our clinic, we consistently carry out fumigation process every week wherein the whole clinic is treated with chemical fumes. In addition, we also use the Attest Biological Monitoring System by 3M ESPE to verify the effectiveness of our sterilization efforts. The 3M Attest® sterilization monitor is a proven and reliable system backed with a 20-year product history in using the innovative Biological Indicator System for monitoring steam sterilization processes. We use this to ensure that our sterilization controls and standards remain above the required standards. ✔ Dry-block design is pre-set to proper incubation temperature which ensures consistent and accurate results.